TORONTO — Karolina Pliskova stepped onto the court, shook off some nerves, and began her run as World No. 1 on a positive note. The 25-year-old from the Czech Republic downed Russian Anastasia Pavlyuchenkova 6-3, 6-3 on Wednesday to reach the third round of the Rogers Cup, extending her winning streak over the 19th-ranked player to five straight matches. "I had a little bit (of nerves) before my match because I really wanted to win this one," Pliskova said. "Also I knew I have a good record against her. So I just knew if I play solid and OK I can win it." As the top seed, Pliskova received a bye into the second round. She became the World No. 1 when Johanna Konta beat Romania's Simona Halep in the quarter-finals at Wimbledon. Pliskova, who fired four aces and broke Pavlyuchenkova seven times over the one hour 12 minute match, said that being the top player in the world didn't make her feel any different before it started. "I was not really thinking about this," she said before assessing her play. "I think some moments (of the match) were OK, but otherwise the serve was not great and overall I was not real happy with my game today. But it was enough and so another chance tomorrow to improve." Pliskova will play Japan's Naomi Osaka in the third round. The 50th-ranked Osaka upset No. 16 Anastasija Sevastova 6-3, 6-4. Halep defeated Slovakia's Magdalena Rybarikova 6-3, 6-4, in one of the day's late matches. Halep was the crowd favourite with a sizable contingent from her home in Romania cheering her on. "It's a pleasure always to play here and gives me more energy, I think I can say. And also, like, I'm fired up all the time when I play," said Halep. "And I did want to win every match that I play here. So maybe that's why I did some great results in the last two years. Hopefully this last year I can just repeat or go forward in the tournament." 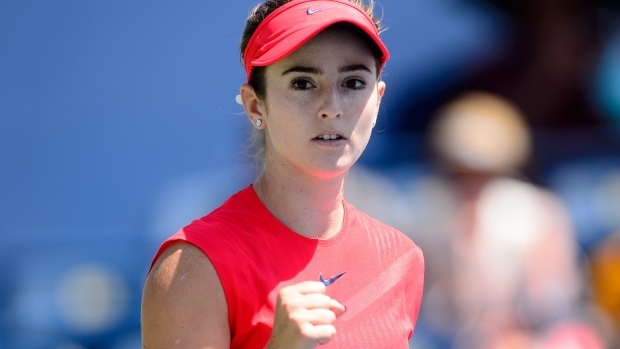 In another upset, American teenager Catherine Bellis downed eighth-seed Svetlana Kuznetsova 6-4, 7-5. Bellis won 74 per cent (39 of 53) of her first-service points and broke the 32-year-old Russian three times. The 18-year-old Bellis, ranked 36th in the world, broke Kuznetsova in the first game of the first set and twice more in the second, including in a crucial 11th game that gave her a 6-5 lead. "I think I played really well today," Bellis said following the second career win against a top-10 opponent. "Obviously I told myself I had to (play well) because she's unbelievable." Bellis will face France's Caroline Garcia, who defeated American qualifier Varvara Lepchenko 6-1, 6-4, in the third round. Wimbledon champion and fourth seed Garbine Muguruza of Spain moved on with a 7-5, 6-2 win over Belgium's Kirsten Flipkens. Muguruza, who will next play Australian qualifier Ashleigh Barty, admitted to being frustrated after failing to make some shots against Flipkens in the first set. "It was hard. I think that I had a lot of opportunities during the set, and I felt like I didn't use them," the 23-year-old Spaniard said. "So, you know, I just tried not to be very frustrated, tried playing, concentrating and thinking that I will have another chance." Barty upset 16th-seeded Elena Vesnina 6-3, 5-7, 6-4 to advance. In other second-round play, ninth-seed Venus Williams earned her second career win in Toronto, a 7-5, 7-5 victory over Katerina Siniakova. Williams, the runner-up at the Australian Open and Wimbledon this year, hadn't won in the Canadian city until she beat Irina-Camelia Begu in the first round on Monday. "It was well-earned. I had to wait a long time for win No. 2," said Williams. "So I would like to build on that to win No. 3." Agnieska Radwanska topped Timea Babos 6-0, 6-1 and Lucie Safarova moved on with a win over Dominika Cibulkova 6-2, 6-4. Also Wednesday, American Sloane Stephens defeated Petra Kvitova of the Czech Republic, 7-6 (4), 3-6, 6-2, and Russia's Ekaterina Makarova downed Konta 5-7, 7-6 (4), 6-3. In the final match of the night third-seed Angelique Kerber advanced with a 6-4, 7-6 (5) win over Croatian qualifier Donna Vekic, who beat Canada's Eugenie Bouchard in the first round.